I think I failed her... somewhere along the way some lesson must not have been taught, some basic fundamentals totally lost. Maybe the schools got to her, as this is what my daughter would do if she was president. As it may be hard to read- here it is, misspellings and all. 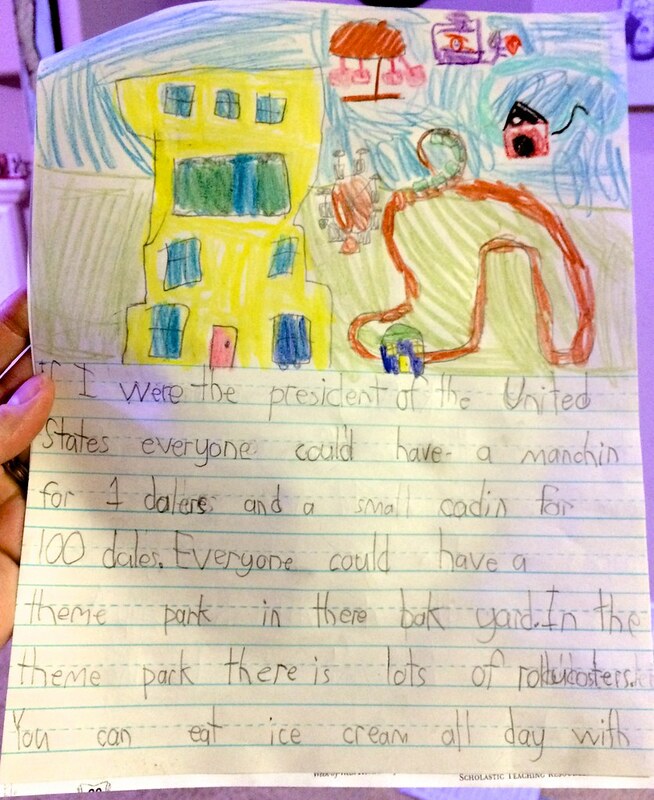 "If I were the president of the United States everyone could have a manchin (mansion) for 1 dolere (dollar) and a small cadin (cabin) for 100 doles (dollars). Everyone could have a theme park in there bak yard. In the theme park there is lots of rollur coasters. You can eat ice-cream all day with out getting sick. Everyone would ride in hellucopters that are fancy insted of cars. Everyone would have majikll (magical) papers so when you tok (talk) and you want to rite (write) it then it will show up. As you can see, I want to be the president." Oh my poor daughter, I have failed you. Do you not know your father was once an Economics major. Have we not taught you the value of the dollar and hard work? Have we not taught you that you can't just give to all freely for no work in return. My daughter, I am sorry, I have failed you, for it seems you have become a socialist democrat. ** Disclaimer: I do not believe or am claiming all democrats are socialists. This post was written in fun and jest. I am a former Social Worker who worked for the state and saw the good and the need for programs to help and assist people. I also saw these systems abused. I greatly believe in helping, serving and doing going- but I believe in helping a man learn to fish rather than just handing out the fish. I could say so many things about our government but I won't, other than to say we definitely sit on the same side of the fence! This is so funny. 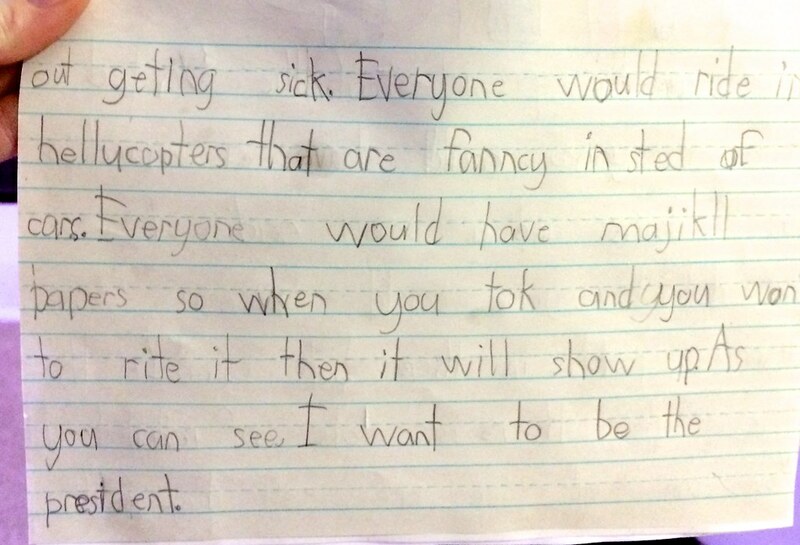 Kids have the best imaginations! Her drawing rocks!! Stopping by with comment love from the SITS girls! Now a new follower too!! Yes they definitely do, her brother helped her get started on some of the crazy ideas. She does love drawing. Unfortunately she is spot on in her belief of what it means to be President. At least she has the age of innocence behind her. I'd elect her, I want a mansion for $1. She's got my vote. LOL! I was reading it thinking, "Oh. That's not so bad. This mom is being too hard on herself. All little kids spell and want crazy big things." Then I read the last paragraph and almost spit my coffee out. Hilarious! I would like to make a request that the all-day ice cream eating not only not make us sick, but also not stick to our thighs or hips. I hope she'll take this under consideration right away. Oh yes!! If she could figure that out she would be unstoppable! I like her her dream way better than my son's. Remember what he wrote about? More sports, namely "dodge the trash"?! Kids! So funny! Love it. Found you via SITS! !